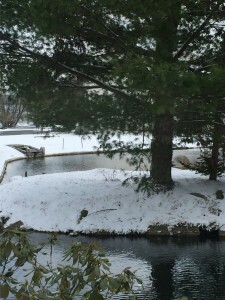 A spring snowstorm arrived overnight in the Berkshires, triggering more childhood memories. Haven’t lived where snow is a regular event for more than twenty-five years. There was plenty of warning. We all knew the snow was coming. I went to the Stop & Shop yesterday afternoon. Stocked up on groceries for a couple days’ worth of meals. When the wind awakened me in the middle of the night, I got up and peeked through the blinds, still a little surprised to see the forecast snow accumulating. Turned the heat up a couple degrees and went back to bed, burrowing under the covers as I did when I was a child. When I reawakened at seven, the snow was still blowing. Suddenly it was as if I were listening to the behemoth wood-paneled Zenith radio that stood next to the kerosene stove in our kitchen in 1955. I remembered the radio announcer and the “no school” bulletins. Heard the wind echoing in the chimney. Felt the cold linoleum floor beneath my feet on the way to the bathroom. Smelled the coffee percolating on the counter. Sniffed the burnt toast that my mother grilled directly on the cast iron stove top. Given any feasable alternative, my mother always avoided dirtying a pan. Smelled the wet wool from Mummy’s gloves drying in the open jaw of the warming oven. She helped Daddy broom off his car before he left for work. This morning, after my own coffee, I returned to the memoir chapter that I was working on at bedtime.